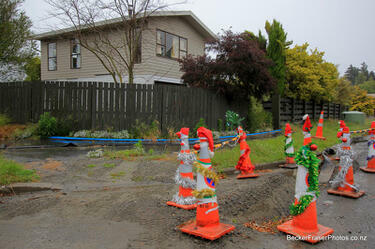 A photograph of a road cone on Kingsford Street that has been decorated to look like a Christmas tree. 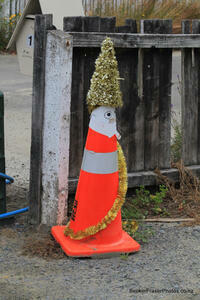 The road cone has been wrapped with tinsel and a decoration of an angel placed on top. 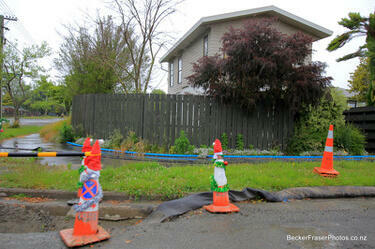 A photograph of a road cone on Kingsford Street that has been wrapped in tinsel and decorated for Christmas. 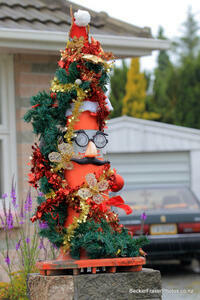 A Santa hat and glasses have also been used to decorate it. 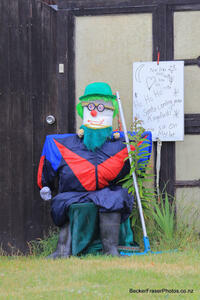 A photograph of a scarecrow on Kingford Street in Horseshoe Lake. A sign next to the figure reads, "You like my wig. I love you Santa. Ho ho ho, is Santa coming to Kingsford? Please sit on my lap". 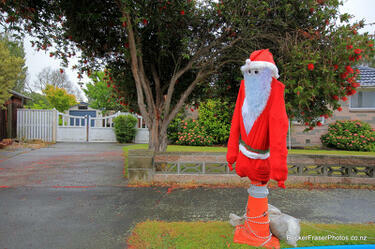 A photograph of a road cone decorated with tinsel and tied to a letterbox on Kingsford Street in Horseshoe Lake. 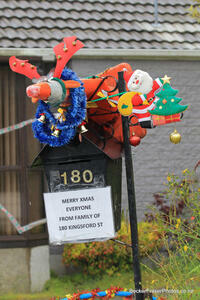 A sign on the letterbox reads, "Merry Xmas everyone from family of 180 Kingsford St". 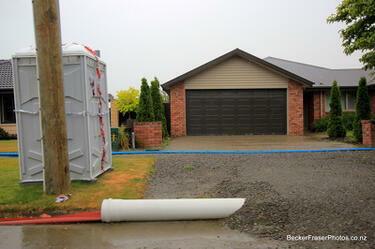 A photograph of a road cone on the fence of a residential property on Kingsford Street in the Horseshoe Lake district. The cone has been decorated to look like a Christmas tree. 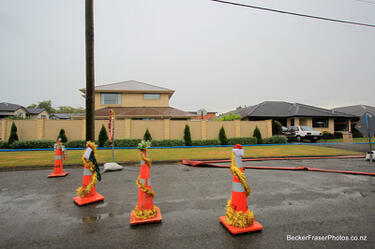 A photograph captioned by BeckerFraserPhotos, "Christmas cone decorations linger on in Kingsford Street, Horseshoe Lake, Burwood". 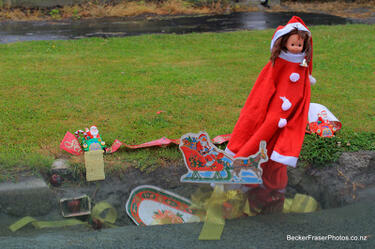 A photograph of a portaloo hung with Christmas decorations on Moncrieff Place in the Horseshoe Lake district. 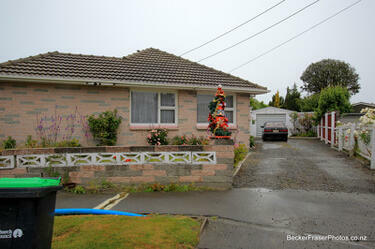 A photograph captioned by BeckerFraserPhotos, "Residential properties on Alice Street in the Horseshoe Lake district". Road cones on the side of the road have been decorated with tinsel for Christmas. 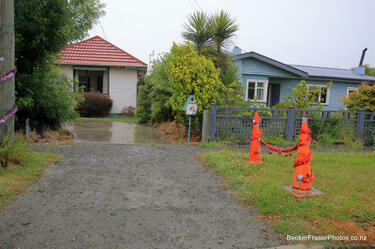 A photograph captioned by BeckerFraserPhotos, "Residential properties on Alice Street in the Horseshoe Lake district". 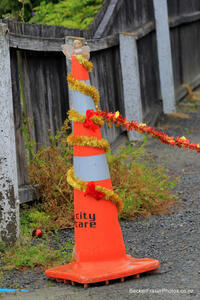 A road cone on the side of the road has been decorated with tinsel for Christmas. A photograph of a road cone decorated with Christmas tinsel. The photograph is captioned by BeckerFraserPhotos, "Kingsford Street, Horseshoe Lake, Burwood". 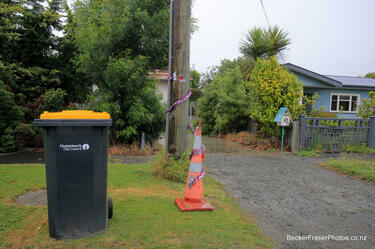 A photograph of a road cone on the side of Kingsford Street in the Horseshoe Lake. The cone has been decorated to look like Father Christmas. 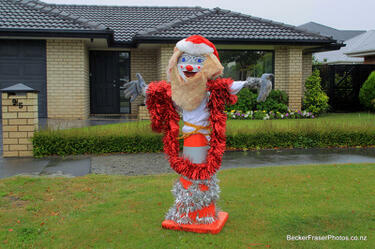 A photograph of a road cone decorated as Santa Claus along Kingford Street in Horseshoe Lake". 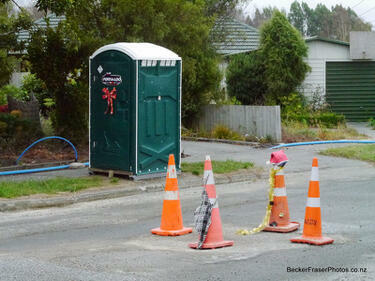 A photograph of road cones on Kingsford Street in the Horseshoe Lake district. 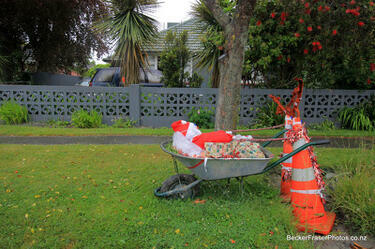 The road cones have been decorated as reindeer, towing Father Christmas in a wheelbarrow sleigh. A photograph of a road cone and tree decorated with tinsel on the side of Kingsford Street in the Horseshoe Lake district. 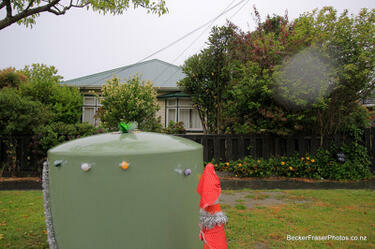 A photograph of a sewage tank decorated for Christmas, captioned by BeckerFraserPhotos, "Kingsford Street, Horseshoe Lake". 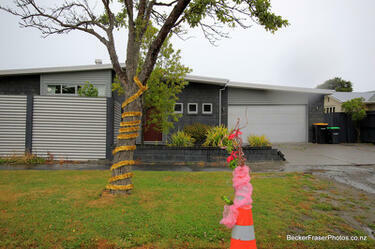 A photograph captioned by BeckerFraserPhotos, "A residential property on Kingsford Street in the Horseshoe Lake district". 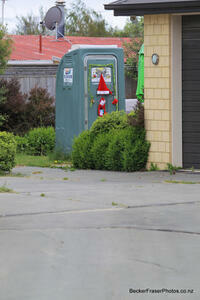 A portaloo on the side of the road has been wrapped in tinsel for Christmas.